Fall is just around the corner which means it’s soup season! 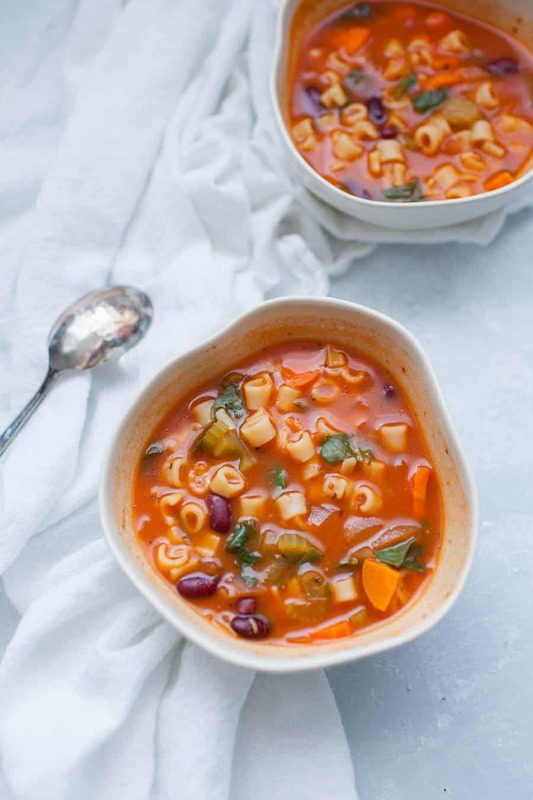 You won’t need to slave over this one all day though, this quick minestrone soup is packed with veggies and flavor and can be made quickly. This classic soup is hearty and satisfying. 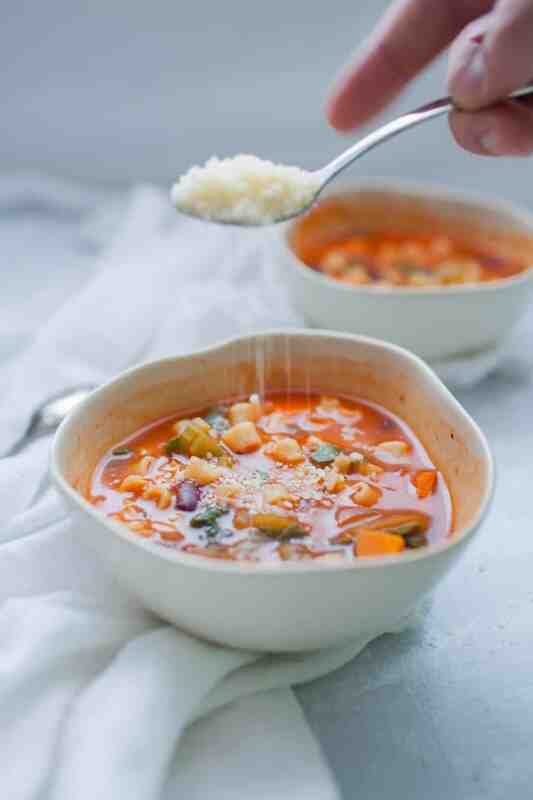 This minestrone soup is something I first shared two years ago but decided that the photos needed an update. And I’m so glad that that forced me to make this soup again because I had forgotten how much I love it! Now the great thing is that my toddler loves it as well. It’s such a great soup for any occasion, too. I took a cooking class recently and the instructor made a comment about “simple” recipes. 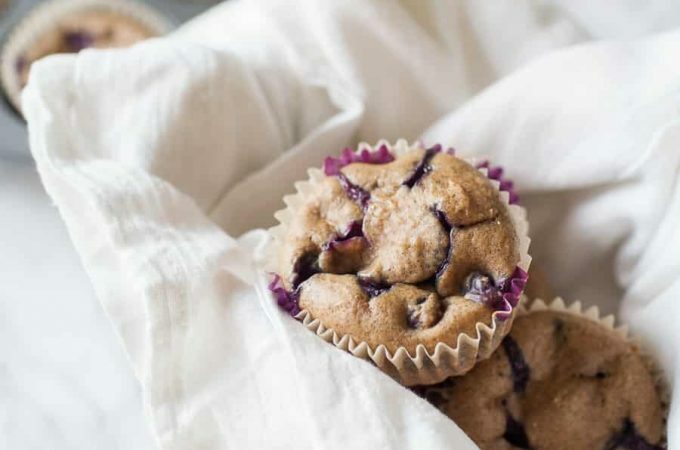 She said that recipes with about 5 ingredients are good because of technique, not because of the ingredients themselves. While this recipe has a few more ingredients than five, I definitely think the “technique” used to make the soup is what makes it great. My favorite ingredient and the thing I think makes this soup so special. The secret sauce to this soup is actually sauce– pasta sauce! It’s the perfect addition for making this soup flavorful AND easy. Because you’re using pasta sauce, there’s no need to let the soup simmer for hours and hours. In fact, it’s ready as soon as the veggies and noodles are cooked through. I’ve mentioned before that I think lunch is the worst meal of the day. I don’t know why but every day it’s a complete struggle to figure out what to eat for lunch. Making a pot of soup at the beginning of the week is the perfect solution for me because it means I don’t have to think about what to eat for lunch every day. It also makes the perfect leftover lunch for Steven to take to work! Last week I came down with a sinus infection/cold/flu situation and was completely knocked off my feet for a few days. I’m the type of person who rarely gets sick, I can’t remember the last time I was! So this soup was my saving grace. It tasted good (which is important when you’re sick and everything sounds unappealing) and I could make it in bulk for the entire week. Whenever we make pasta, we don’t use a ton of sauce, so it’s pretty common for me to have a half used jar of sauce in the fridge. This is the perfect solution to use up that last bit of sauce without feeling like you have to eat pasta again. 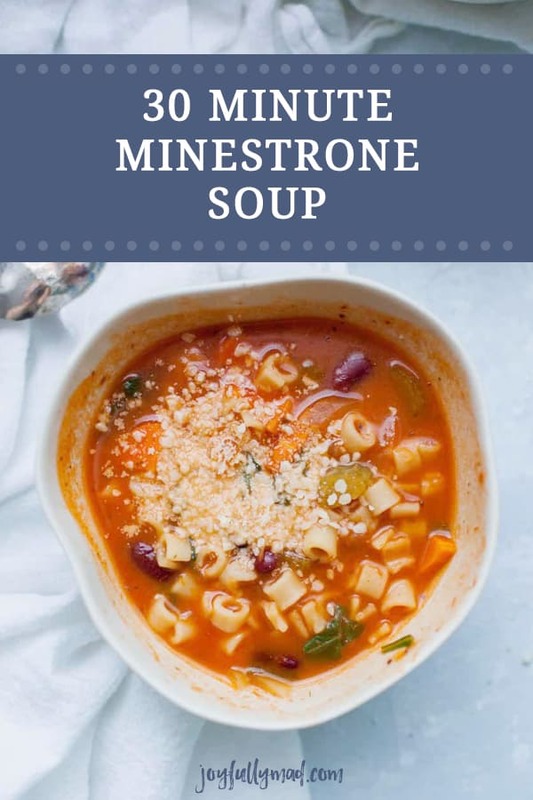 A note about minestrone soup, I’m sure there’s a “classic” way to make it and maybe my Italian study abroad didn’t teach me the proper way, but to me, minestrone is a perfect soup to use up whatever veggies you have on hand. 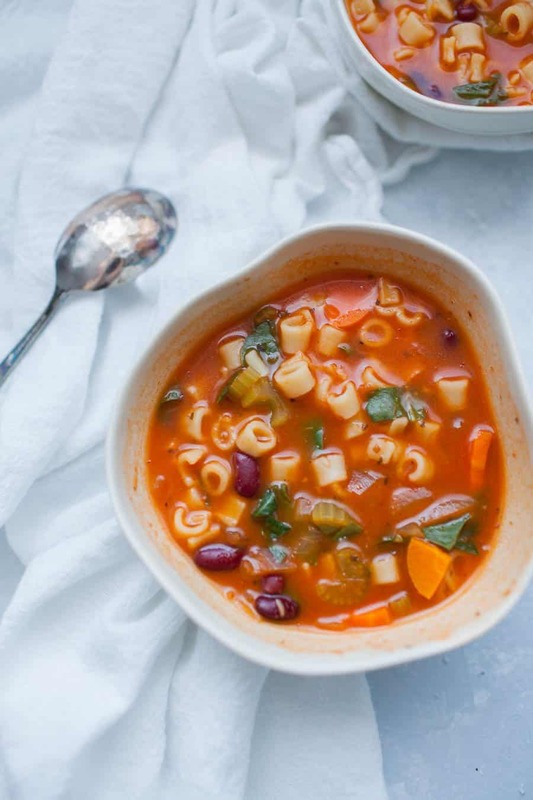 I’ve seen minestrone soup recipes with green beans, onions, meat, kidney beans, zucchini, and squash, so the options are quite limitless. 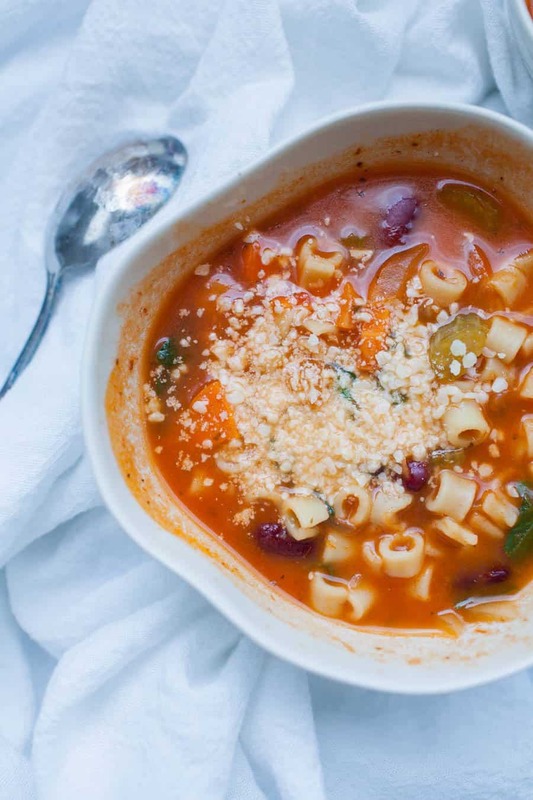 You can also totally vary the pasta in this soup. 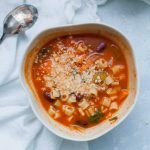 I’ve used large pasta before but this time I loved using ditalini which are the perfect size for a soup like this! Have I convinced you to try it? 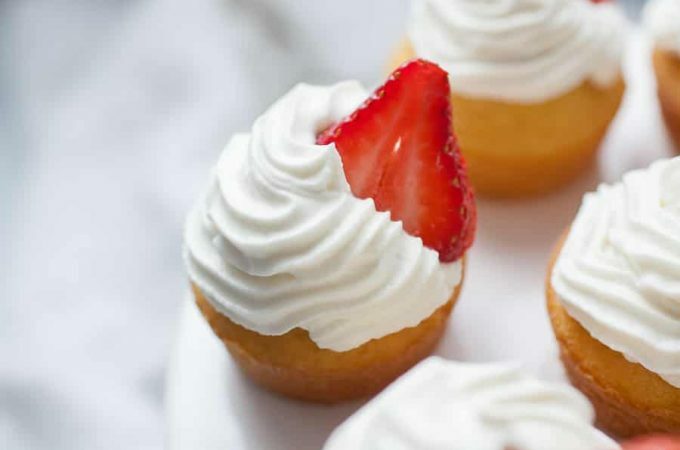 Scroll down to get the recipe! Combine ingredients (except parmesan and spinach) in large stock pot, bring to boil. Allow to boil and cook until vegetables and pasta are cooked (about 30-40 minutes). Place spinach in pot for 2-3 minutes before serving. Top with freshly grated parmesan, if desired. When reheating this soup, you may want/need to add more water or sauce to it so that there is enough liquid. This soup looks amazing! Minestrone used to be my favorite. My hubby would LOVE this. I will definitely be making it for him! I love a good homemade soup! 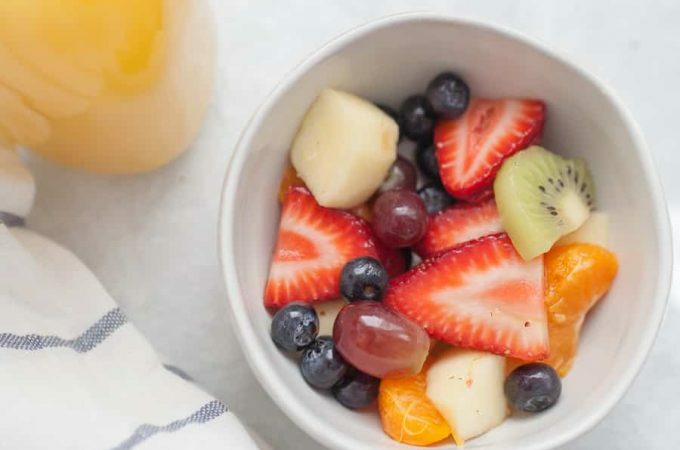 This one looks easy and delicious! Ugh I want a bowl RIGHT NOW! This looks so good. 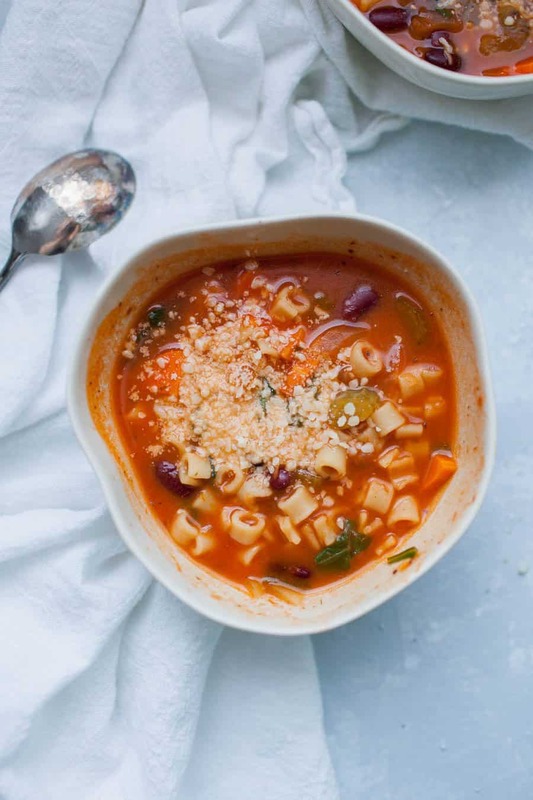 Minestrone soup is perfect for Fall, and I love the pasta you added. It looks so tasty! 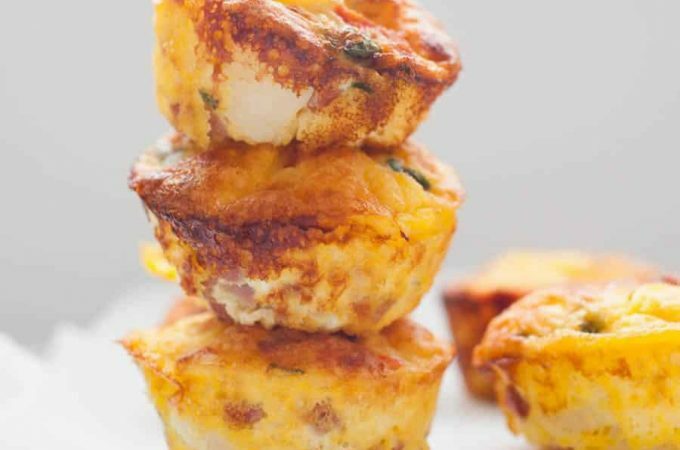 Oh, I love this quick dinner idea, sounds so good! This looks really good! 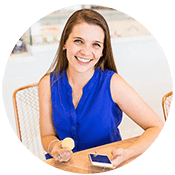 Adding to our meal plan really soon!